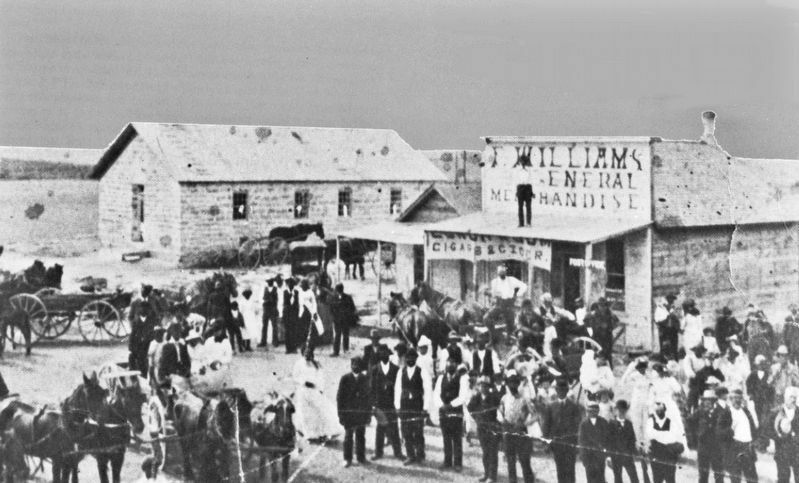 Main Street Nicodemus grew out of hard work and determination into a viable business district through the hands of former slaves. Zach T Fletcher became one of the town's most successful merchants after opening the first black business in 1878. A bank, law offices, two newspapers, a hotel, post office, several stores, and cafes lined these streets. Abuzz with the prospect of securing a stop on one of the railroad lines to the expanding West, more than 25 new structures came in 1886. By the fall of 1888, Nicodemus residents knew a railroad would never come. shop. Jake Riley operated another livery stable and G.M. Sayers ran a general store — demonstrating determination, resilience, and commitment to a land they loved. The café seated more than 30 patrons. The J.B. Crowley Grocery and General Merchandise operated here until the early 1900s. Fredonia and Ray De Priest owned the Café in the 1950s. A team of mules moved this building from Nicodemus township. Owned by Zach T. Fletcher included a livery stable and coral. The Switzer family has live here since the 1930s. The first church established in Nicodemus. The original 1880 building is within the 1907. The congregation still meets in the adjacent building. Built of locally cut stone, the store was purchased and operated by G.M. Sayers starting in 1896. Became the Masonic Hall in 1893. Previously this structure was the Cracker Box School moved here from Nicodemus Township. A depression era project, is the community's center for social activities. "A visitor here in 1918 found only two businesses in existence, one a restaurant with a "two-by-four counter, a box turned upside down for a table, and the rest of the fixtures of the same type… No stores remained in 1950, and three years later the government withdrew its post office there. The black haven on the Solomon had become almost a ghost town." Location. 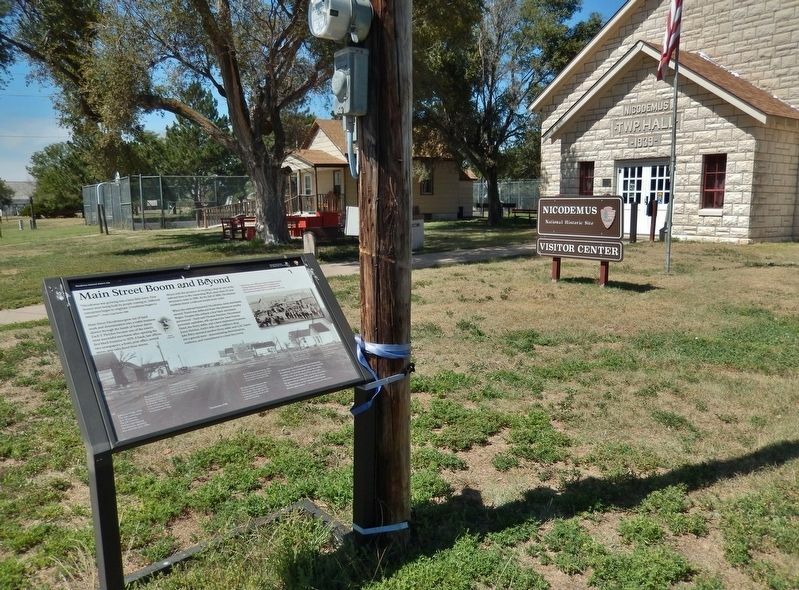 39° 23.592′ N, 99° 36.876′ W. Marker is in Nicodemus, Kansas, in Graham County. Marker is at the intersection of Washington Avenue and 2nd Street, on the left when traveling east on Washington Avenue. Touch for map. 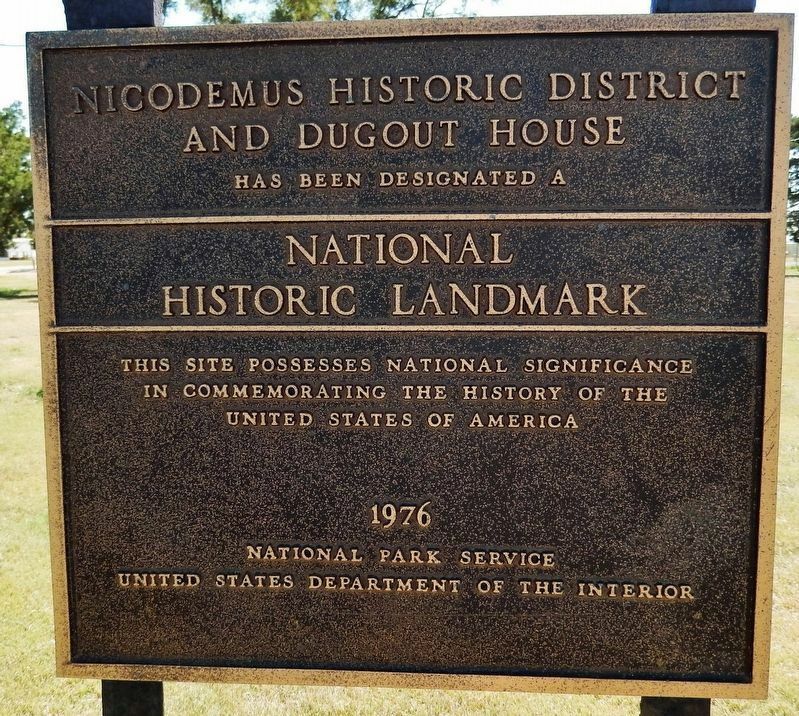 Marker is located beside the sidewalk, directly in front of the Nicodemus National Historic Site Visitor Center. Marker is at or near this postal address: 304 Washington Avenue, Bogue KS 67625, United States of America. Touch for directions. Other nearby markers. At least 5 other markers are within walking distance of this marker. St. Francis Hotel (within shouting distance of this marker); Nicodemus (about 400 feet away, measured in a direct line); a different marker also named Nicodemus (about 400 feet away); First Baptist Church (about 700 feet away); Nicodemus Baseball History (approx. 0.2 miles away). More. 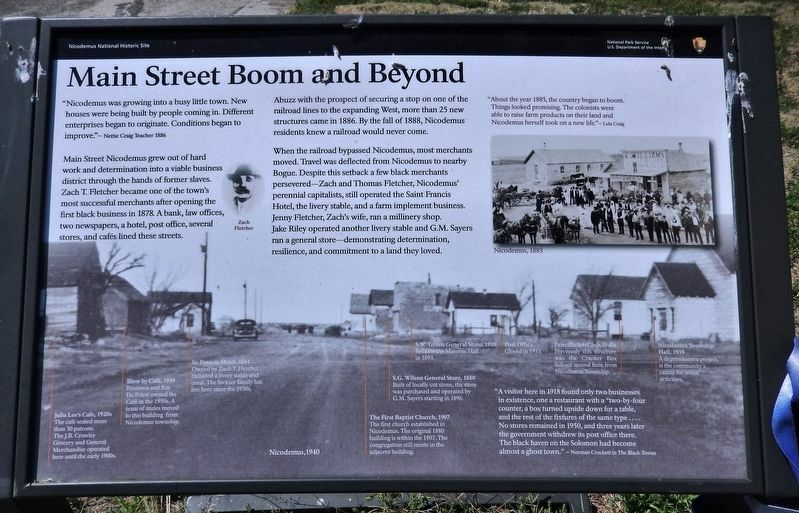 Search the internet for Main Street Boom and Beyond. Credits. This page was last revised on March 28, 2019. This page originally submitted on March 28, 2019, by Cosmos Mariner of Cape Canaveral, Florida. This page has been viewed 36 times since then. Photos: 1, 2, 3, 4, 5. submitted on March 28, 2019, by Cosmos Mariner of Cape Canaveral, Florida.